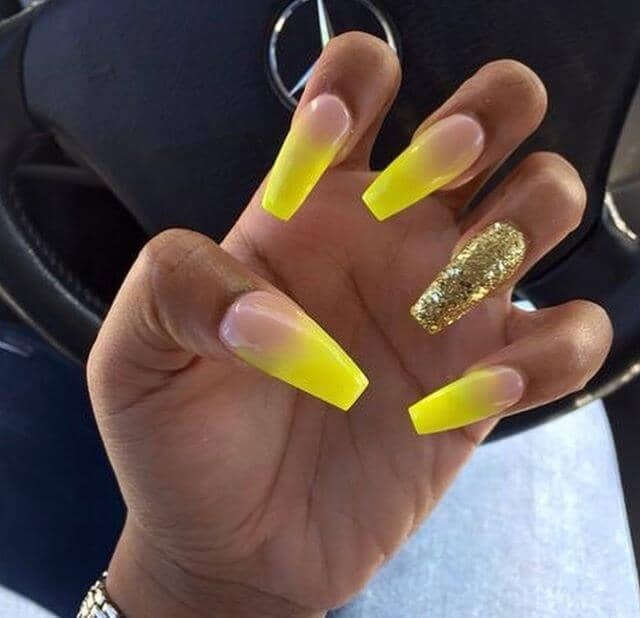 One of the hottest trends in nail fashion is yellow acrylic nails. It is such a versatile color that it can be fun, flirty, glamorous or even sensible enough for work. 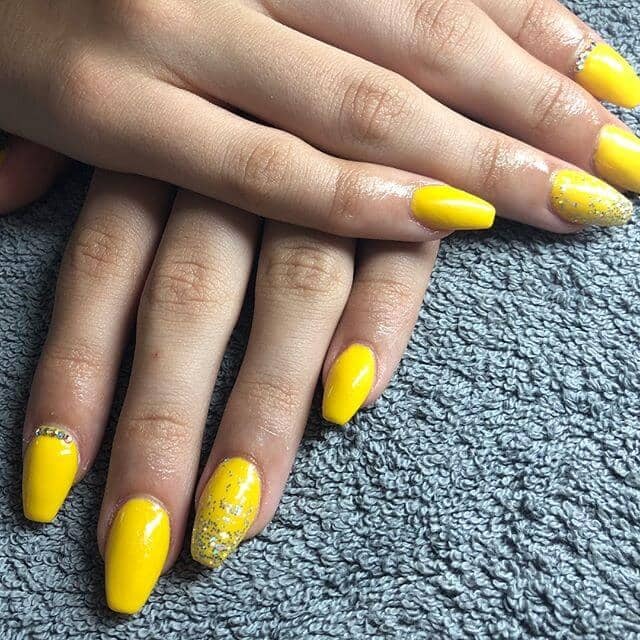 You have so many options when it comes to yellow, and it can add a pop of color to your style. 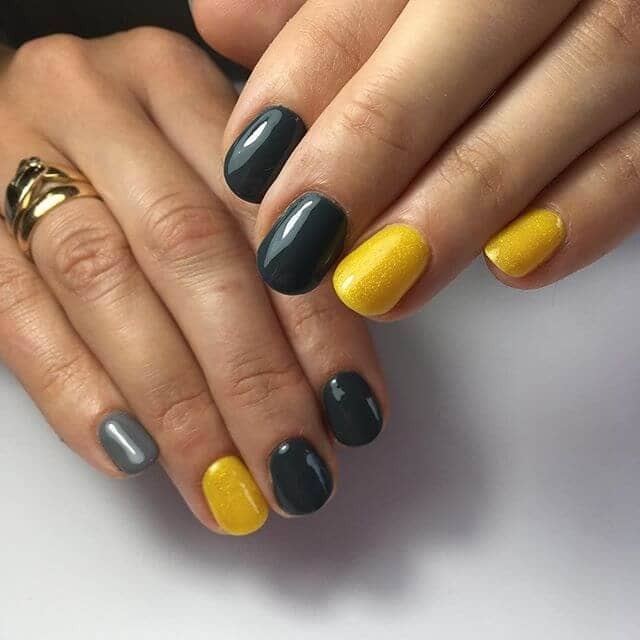 Your nail style and color are two of the best ways to express your unique personality. You can do something exciting without a big commitment, meaning you can show your adventurous side through your nails. 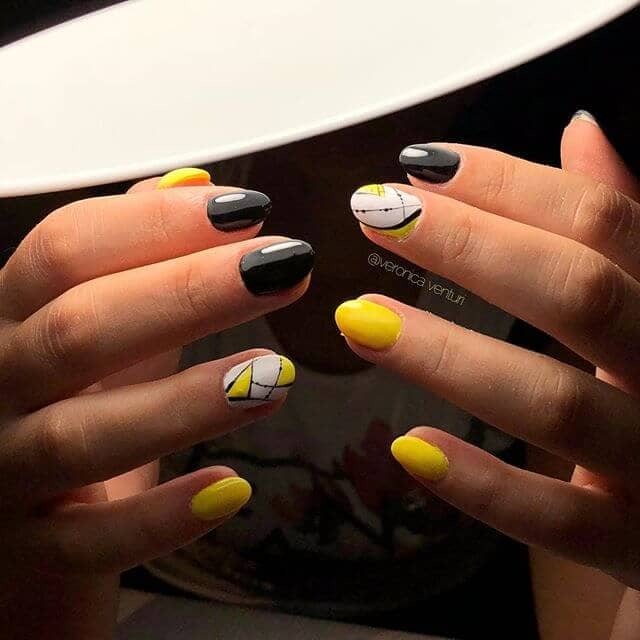 If you have been looking for new nail ideas and want to work the color into your style, these designs will give you some fresh ideas. 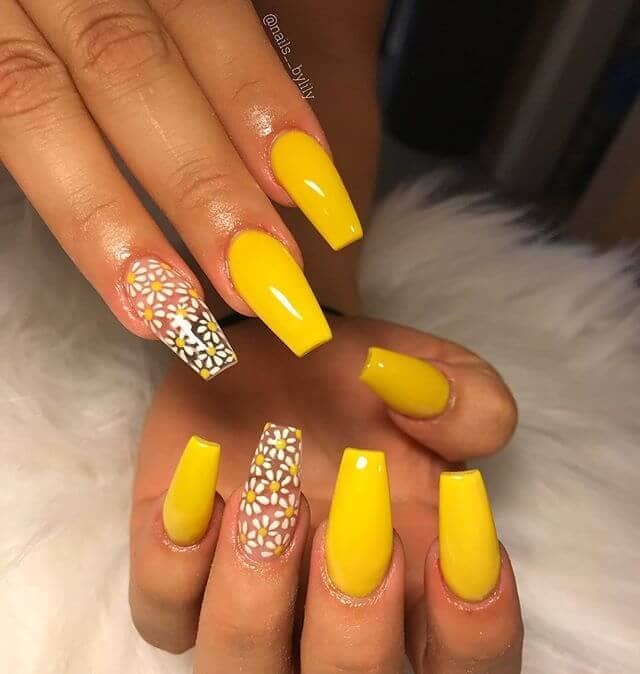 Yellow acrylic nails are one of the hottest nail trends for 2018. The style is so popular because it can be done in so many ways. You can go with bright sunshine yellow or a more muted lemon, whatever suits your own personal style. If you don’t want the color to be too overwhelming, you can opt to pair it with a complementary color like blue or gray. 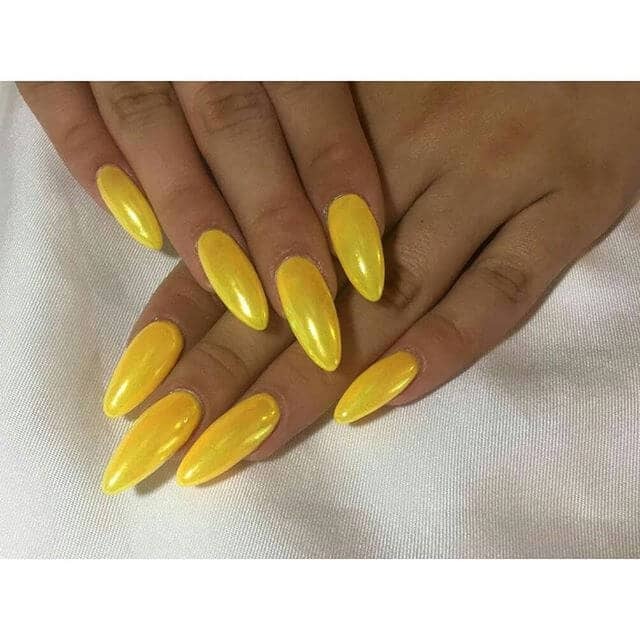 The color looks great on any sort of nails, whether you prefer to wear them long or short, pointy or rounded. It pairs well with cute embellishments. It also works well with any sort of fashion style, whether you toward sophisticated business or casual bohemian. 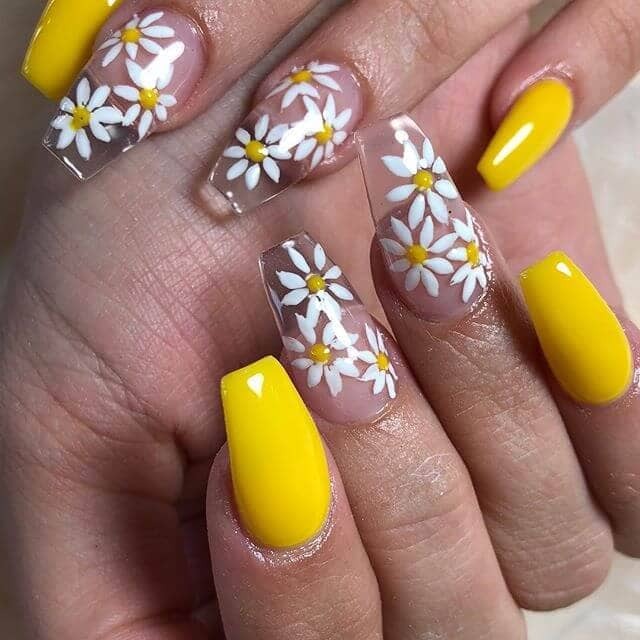 These nails fit perfectly with the sunny days of summer or can add a ray of light to the gray days of winter. You can find a shade to fit any season or mood. 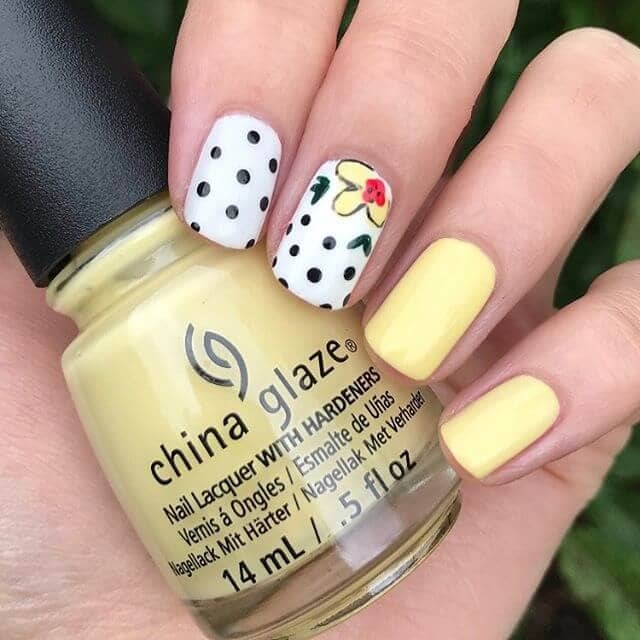 When you are ready to brighten up your day, grab some yellow nail polish or visit your manicurist and try any one of these cute styles. 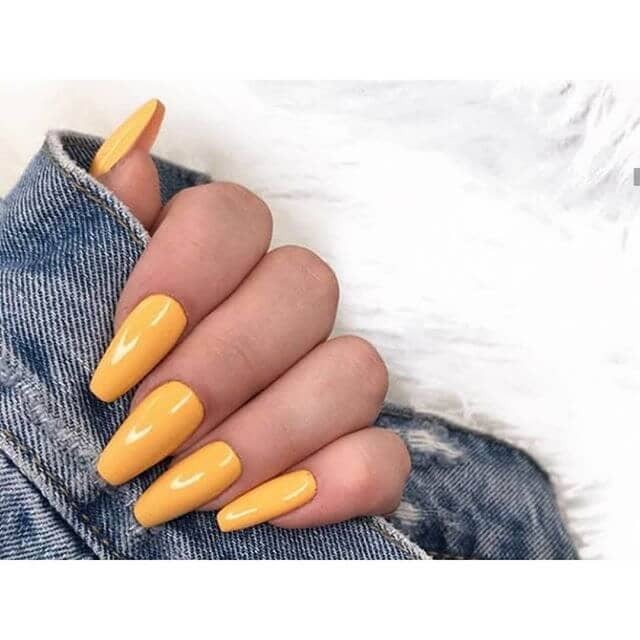 If you want to wear the hot color trend of 2018 but need something a little more understated for work, these short rounded nails in a lovely shade of goldenrod are gorgeous. These nails let your personality shine through, even in your most basic business attire. Pair with deep blues and neutral hues for a perfect work look. Nothing is fresher than black and yellow. 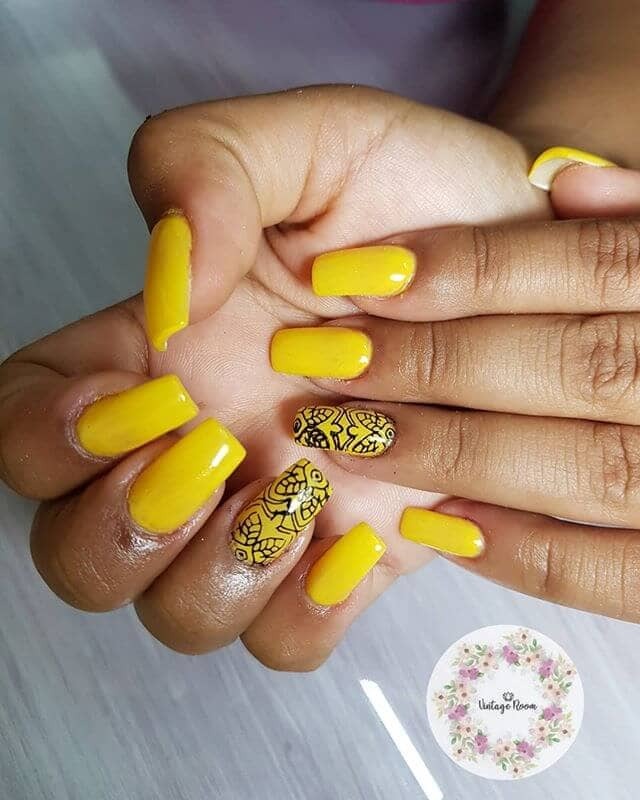 This look captures the combo in the best way with bright acrylics squared off at the tip and painted in yellow nail polish. The ring fingers get an added detail of black art deco flower designs for an added wow factor. 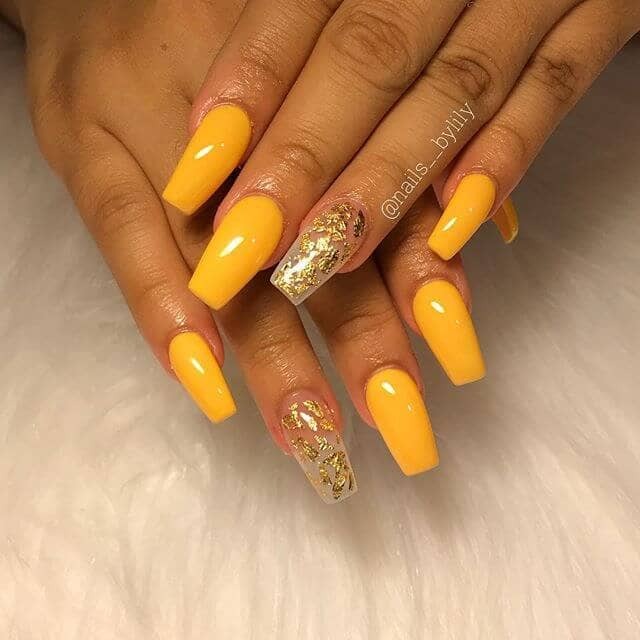 These nails are great for a day trip with your best friends. 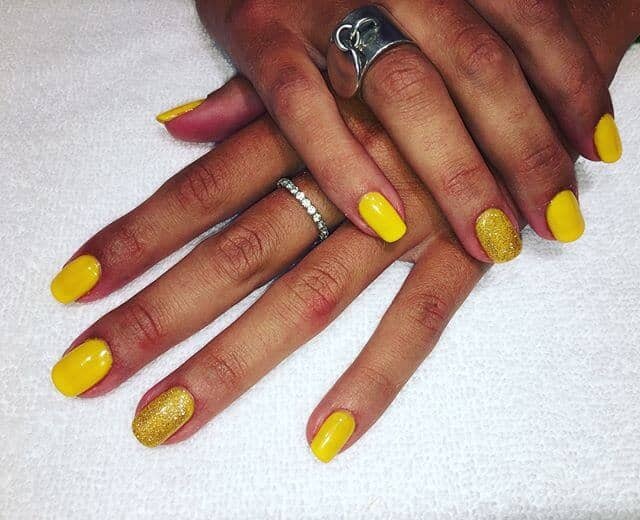 Another great way to achieve the color trend without going over the top is to add a pop of yellow. This look begins with short, pretty nails polished in a shiny clear. 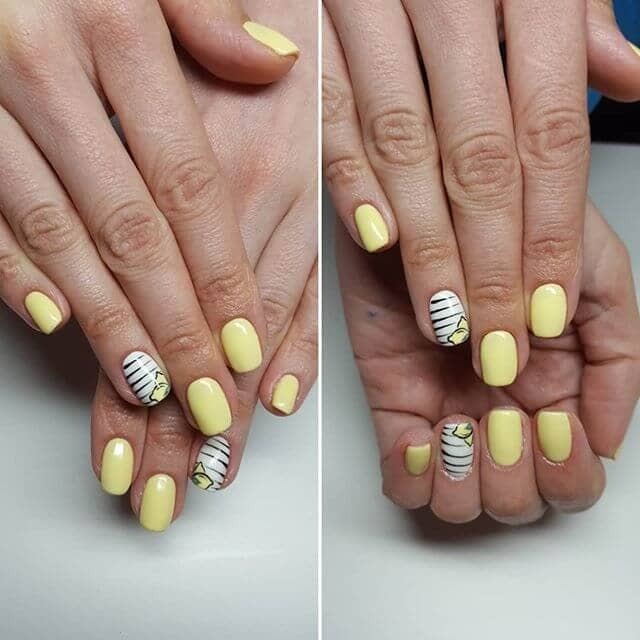 The fun is on the tips, with a pop of bright lemon and a black stripe. This charming style is perfect for your day to day wear. One way to make your nails enchanting is to add an accent nail with gold leaf embellishments. These ballerina’s nails are polished in a brilliant color that complements the gold leaf, giving you the perfect look for an evening event. Pair with sparkling gold rings and a stunning dress to wow the crowd. 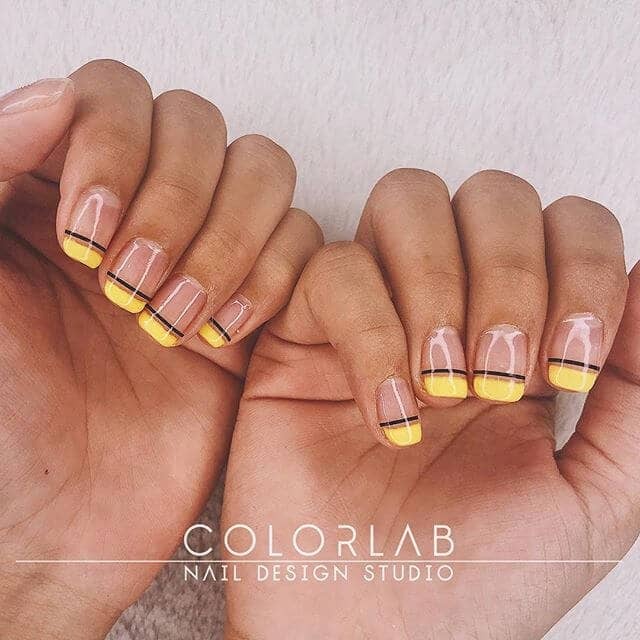 Bring back the fun of your childhood with these playful banana color nails. Black polka dots and red flowers make these nails the perfect accent to your whimsical personality. 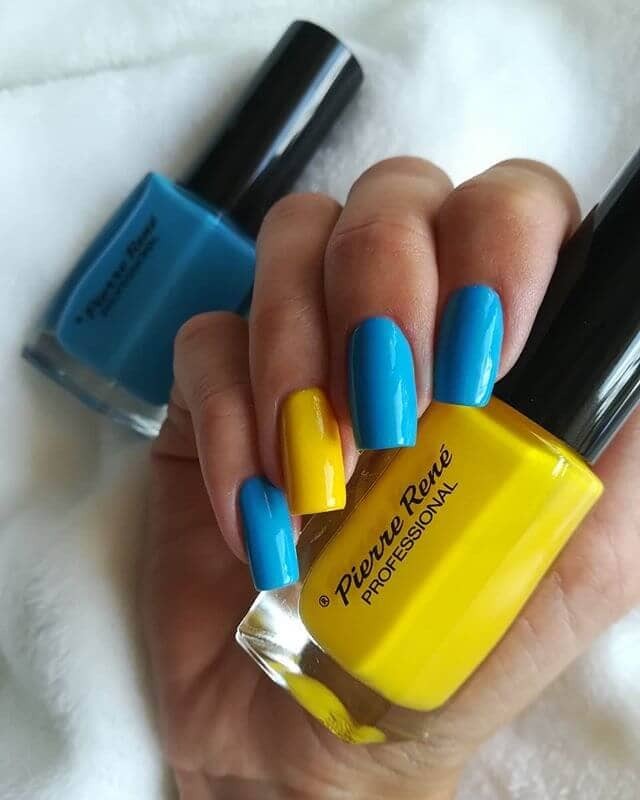 These nails are the perfect accompaniment to your summer theme park vacation. Pair with some sweet red shorts and a black and white tank for a classy look. 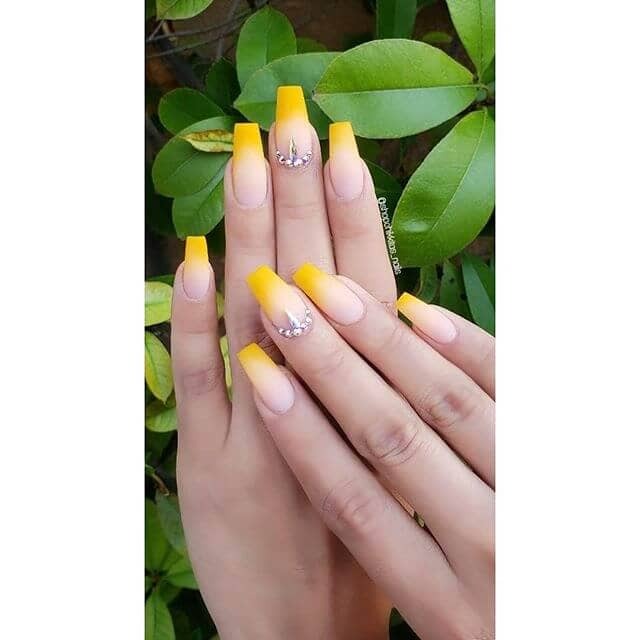 If you are not ready to go with really long acrylic nails, these medium-length square nails are pretty while still making a statement. 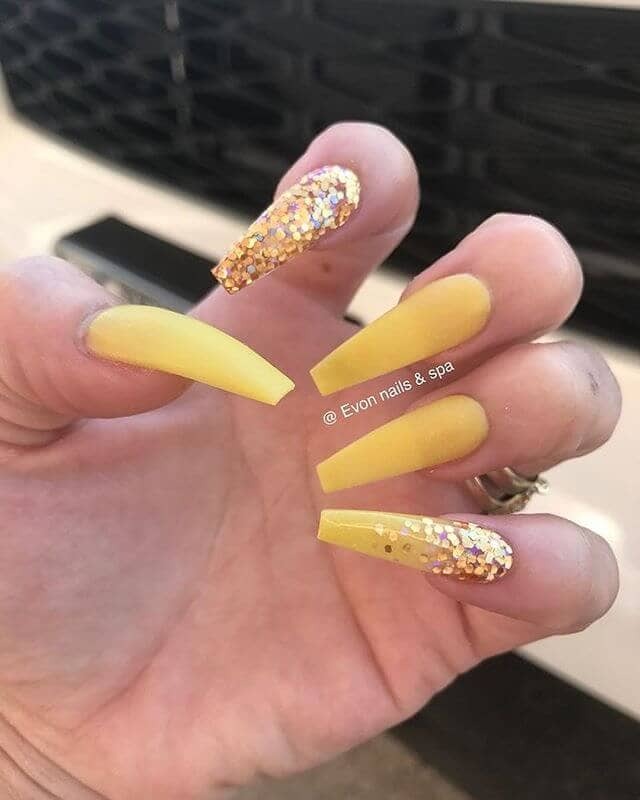 The rich butter color is set off with glitter on the ring fingers and a stripe of diamond and sapphire rhinestones on the nail base of the pointer fingers. These look great with a pair of acid wash jeans. These creamy lemon nails are the perfect nail for you to do at home. Start by trimming your nails short and filing them down to a square. This pale color is versatile, as you can wear it with your favorite white sundress in spring, or with darker jewel tones during the fall. 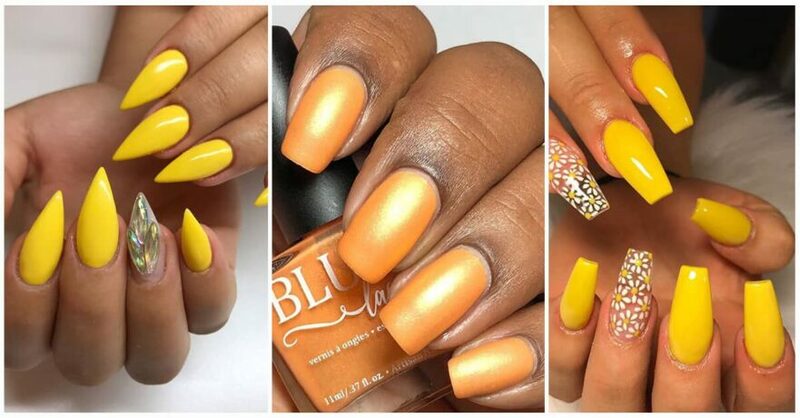 You may think that yellow is a color reserved for spring and summer, but with the right hues, you can have these color nails in the fall and winter as well. It works well during these seasons as an accent color, rather than on every nail. Choose a slightly darker shade of goldenrod and pair with dark winter colors, like the black and gray pictured here. 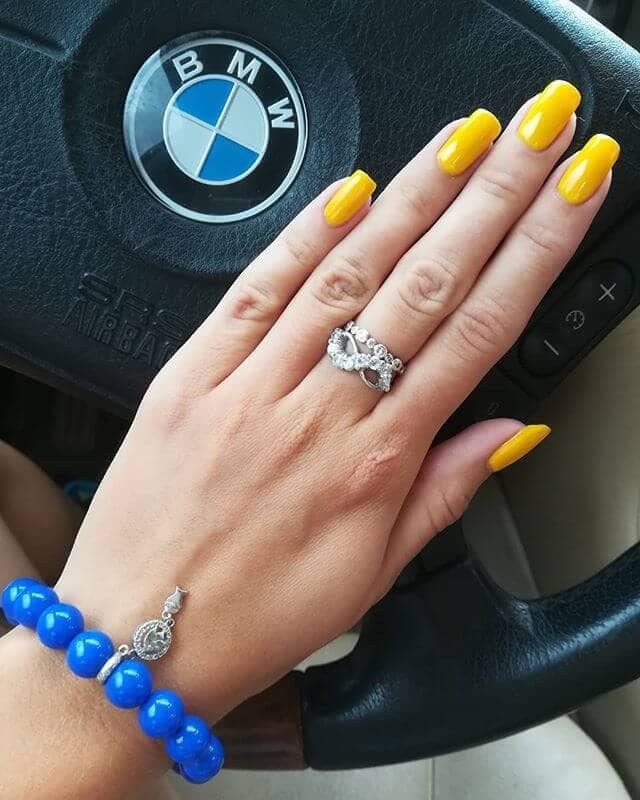 These bright turquoise nails with pops of lemon will bring to mind sunny summer days with clear blue skies. These beautiful colors are the best complement to your fun beach trip with your best friends. You can match these nails with any of your favorite bikinis for a relaxing day in the sand and sun. 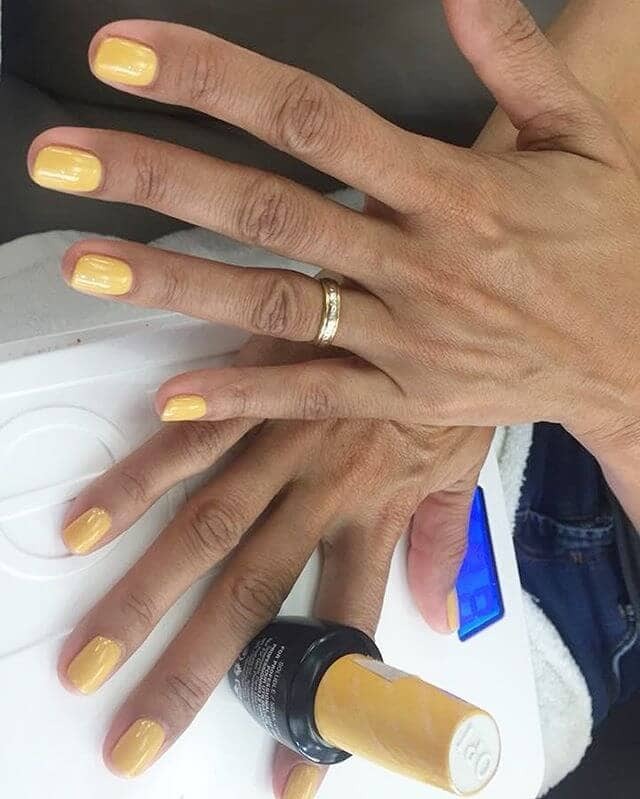 There are many ways to wear the Color trend without going for a full-on yellow nail. 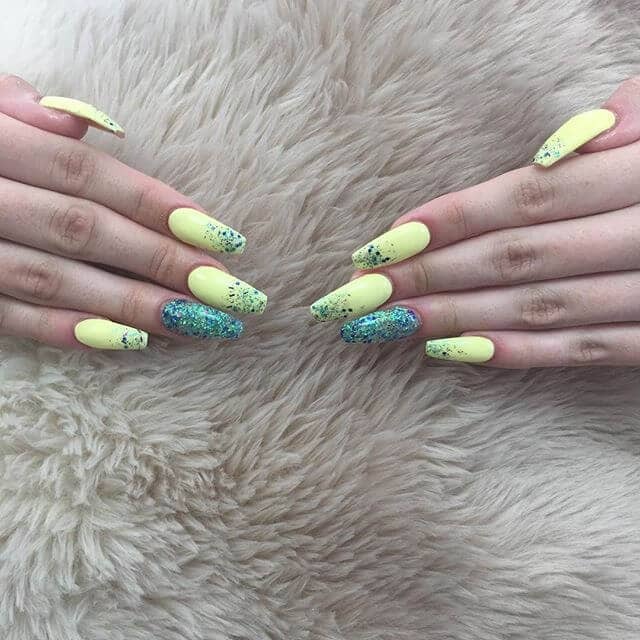 These nails have a classic clear coat base with an understated gold glitter on the tips. For a pop of summer fun, the ring fingers feature hand-painted lemons. Match these nails with your favorite summer outfit for an effortless weekend look. 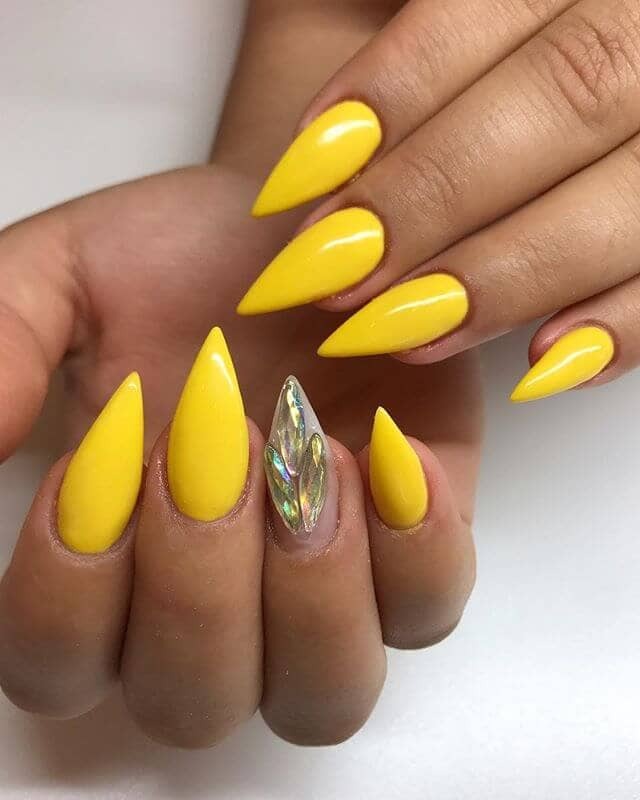 If you are ready to go bold with the color trend, these stiletto nails will certainly make a statement. 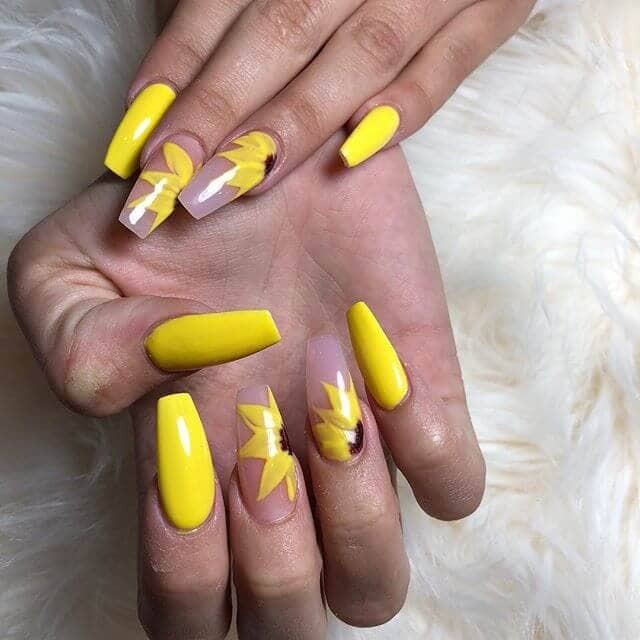 In addition to bright lemon, these nails are set off with white and crisp gold stripes. The nails will look beautiful for a hot summer night on the town with your significant other. For a look that is a little bit naughty and a little bit nice, these almond-shaped acrylics are the perfect mix. 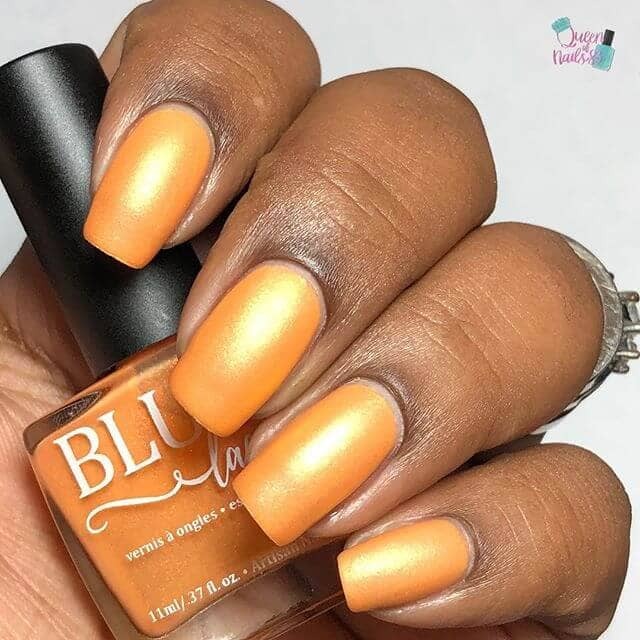 These deep butter nails show your fun and flirty personality and are versatile enough for day or night. Pair with an outfit in shades of red or blue to add to the flirty look. For an unlikely pairing, start with pale lemon coffin nails and accent with a dark gold glitter on the ring finger. These colors make the perfect transition from summer to fall and will work well as your wardrobe moves from bright summer colors to the more muted neutrals of fall. 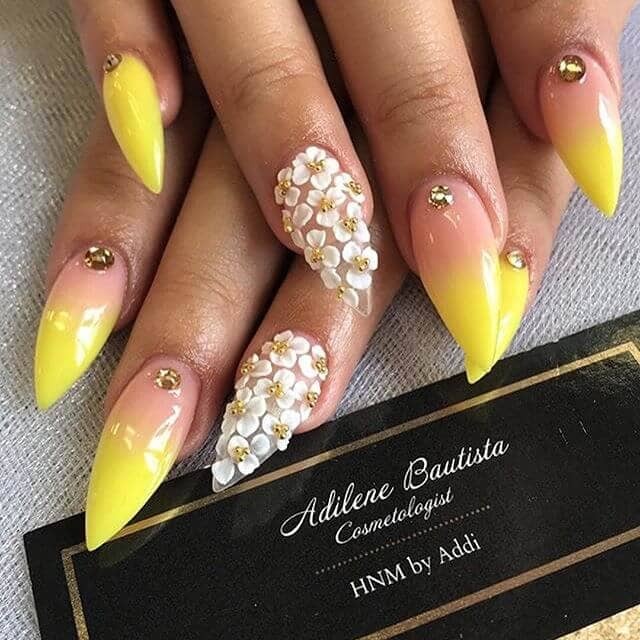 These gorgeous nails prove that stilettos can be pretty with a combination of soft pinks and yellows. 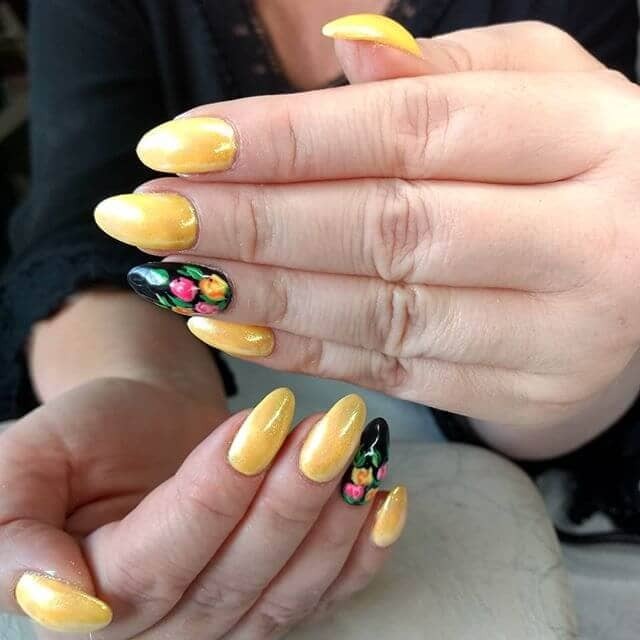 They are further dressed up with rhinestones and accent nails with sweet gold and white flowers. 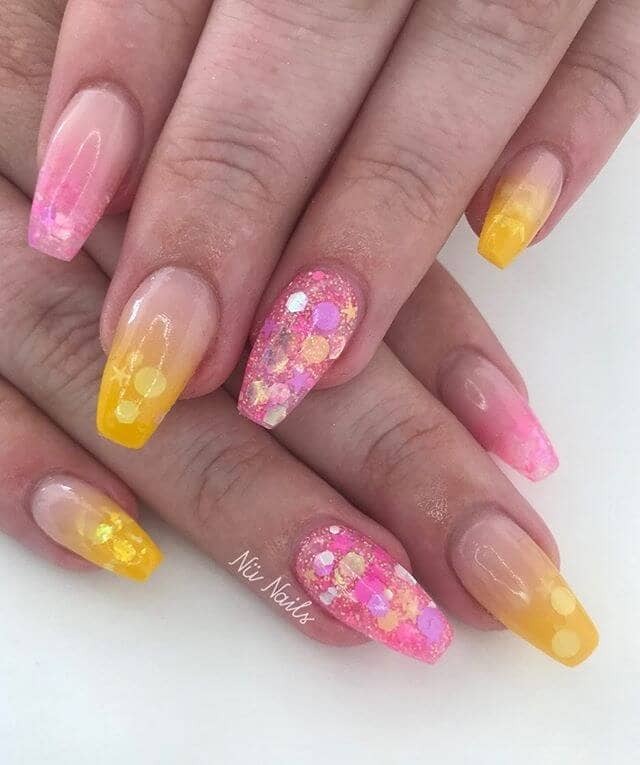 If you are looking for something unique for your wedding, these nails can add some soft color against the elegant white of your dress. 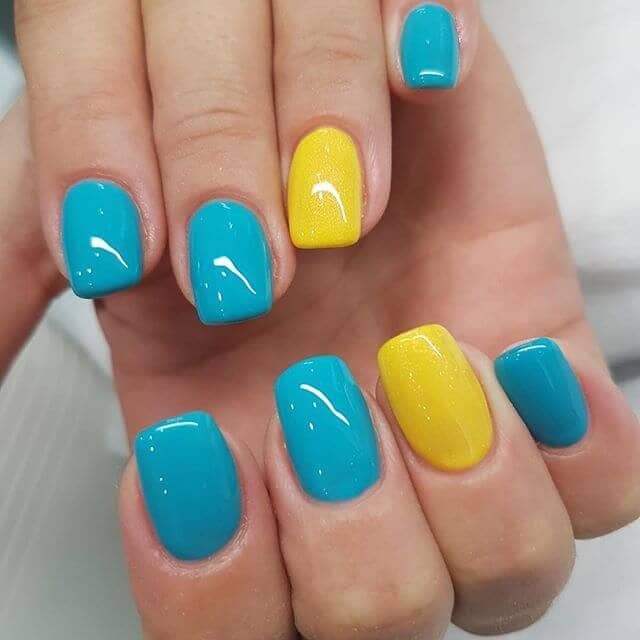 Summer is all about fun in the sun, and these turquoise and bright lemon nails call to mind a day at the beach. These are a daring look with a longer, square shape. 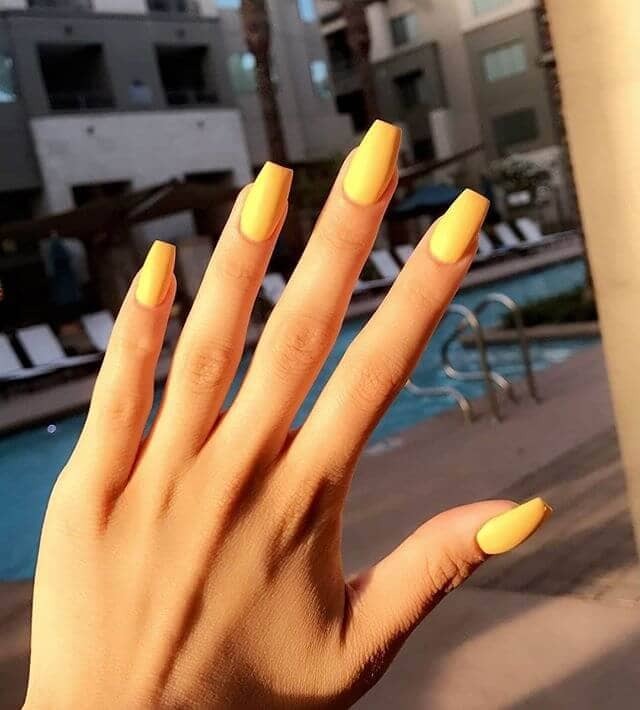 These nails are bold enough to pair with a basic summer outfit. Add your favorite silver jewelry to ramp up the summer vibes. 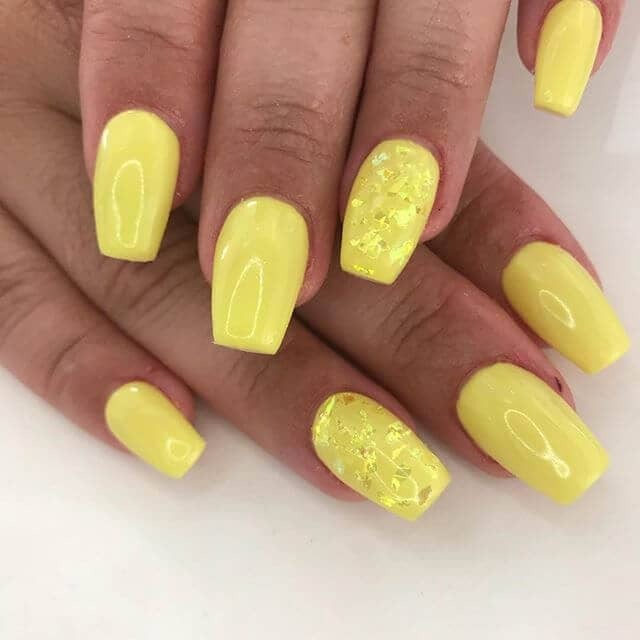 If you are ready to take the hot color trend to the next level, try these neon colored nails to really stand out in the crowd. 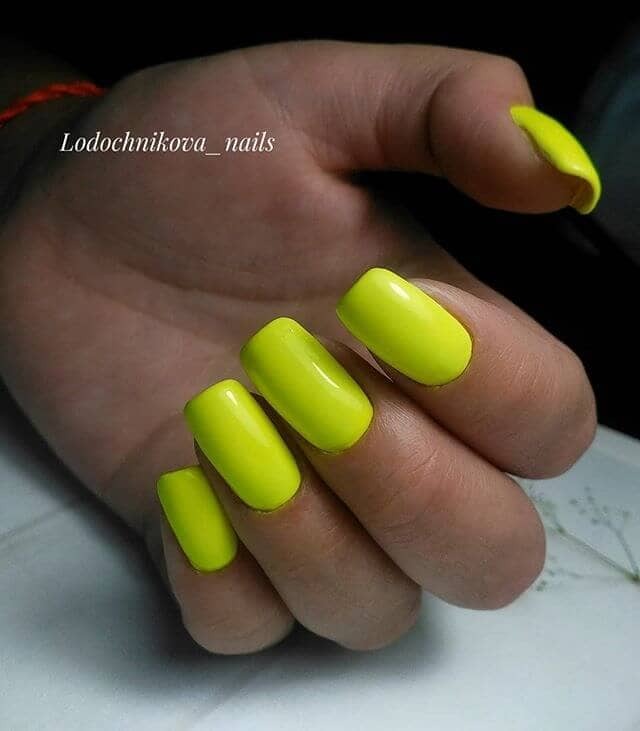 These nails are shorter and squared off to let the neon color really speak for itself. This surprisingly versatile color works well with the brighter hues of summer or the darker hues of winter. 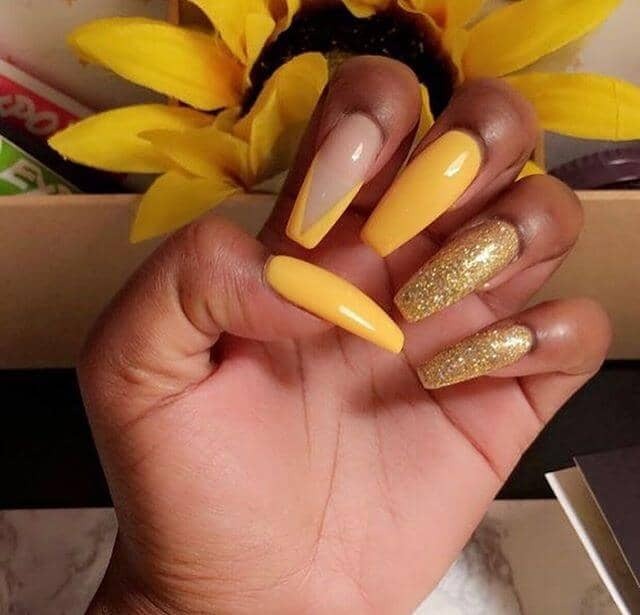 Gold glitter and yellow make your nails anything but boring. 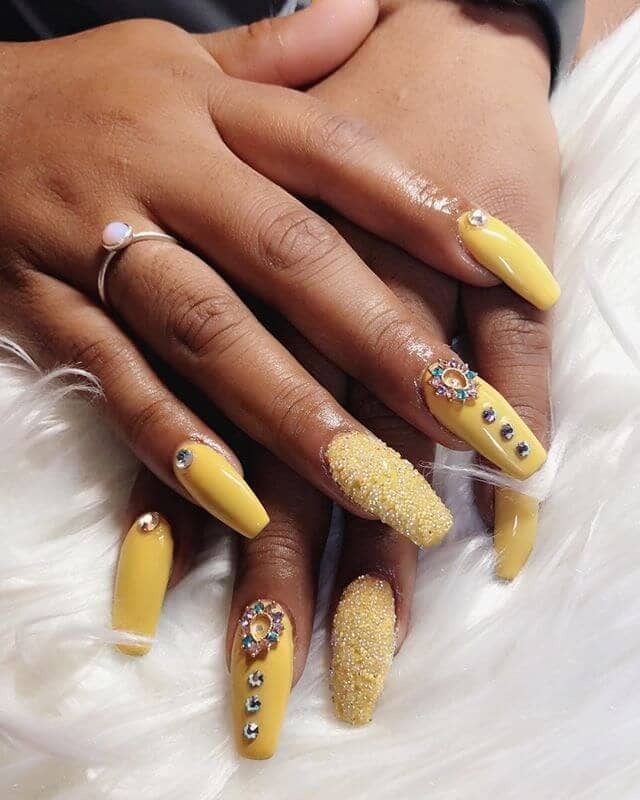 These long acrylics with a square cut shine with accents of gold glitter. These elegant nails are the best look for a formal night. 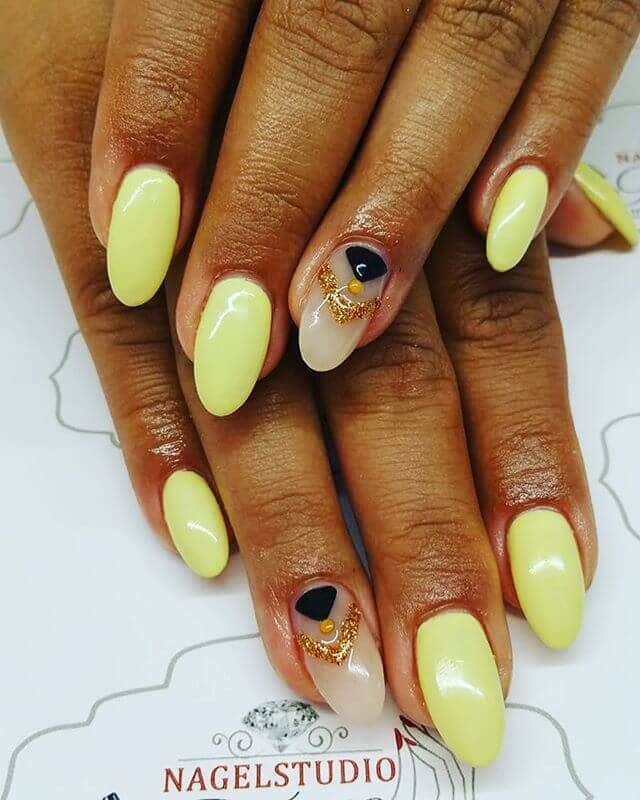 You can wear these nails with a gorgeous navy evening gown for a sophisticated look, or go with a brighter color for something even more fun. 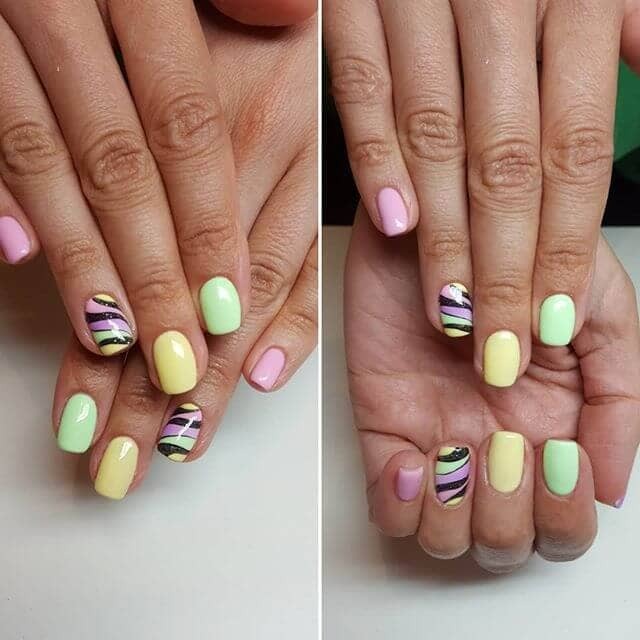 Your nails are a great way to have fun and show your personality, and this nail style is all about playfulness. Lemon is paired with pastel pink and lime green for a sweet summer style. For even more fun, the colors are swirled together with black on the ring fingers. 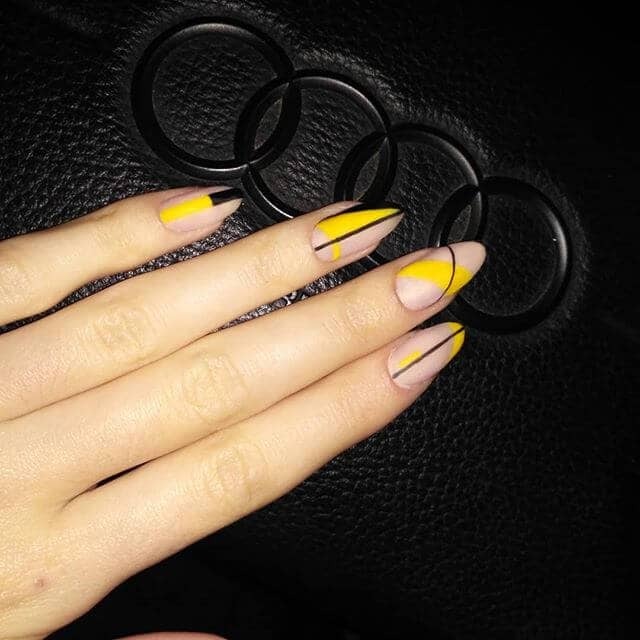 A look this daring should be paired with a simple outfit so that all the focus will be on your nails. 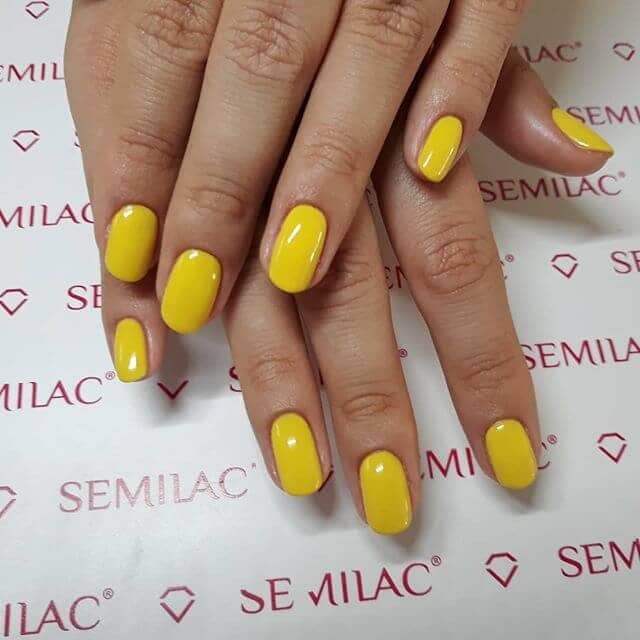 If you are looking for the perfect color and style for spring, go with a pale lemon polish on an oval nail. This look is sweet and pretty for those warm spring days when you’re ready to ditch your winter clothes and put on a sundress. These nails are the perfect complement to a summer garden party. 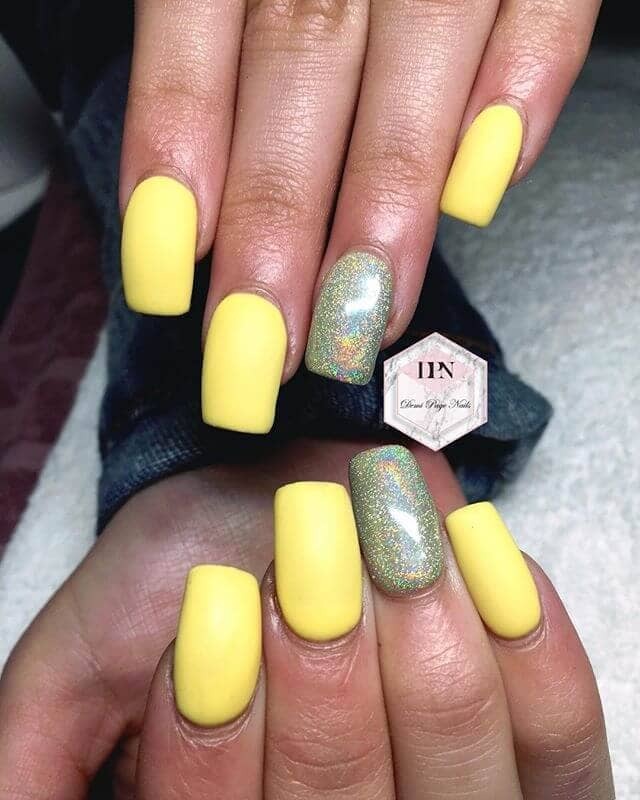 These nails truly embody the color trend with bright yellow acrylic nails with a square cut. The ring fingers are adorned with yellow glitter for a subtle zing. 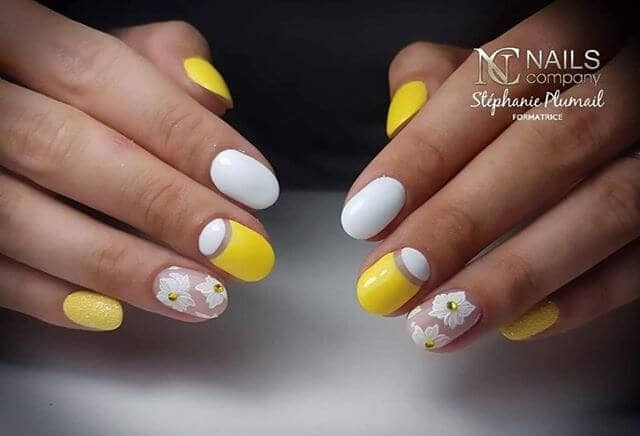 These nails are a perfect fit for your summer wardrobe and will look great whether you are having drinks or going out dancing on summer nights. Shake up your style with a different look on each nail. Start with basic yellow and white. Add in stripes and glitter for flair. Finally, paint the ring fingers in delicate gold and white flowers. 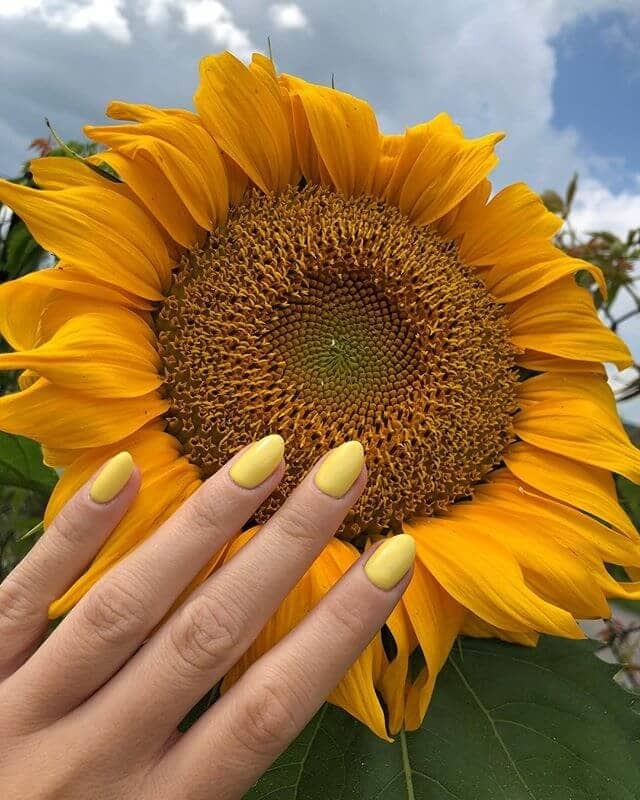 These short rounded nails are a summer go-to for day trips to the park or zoo. 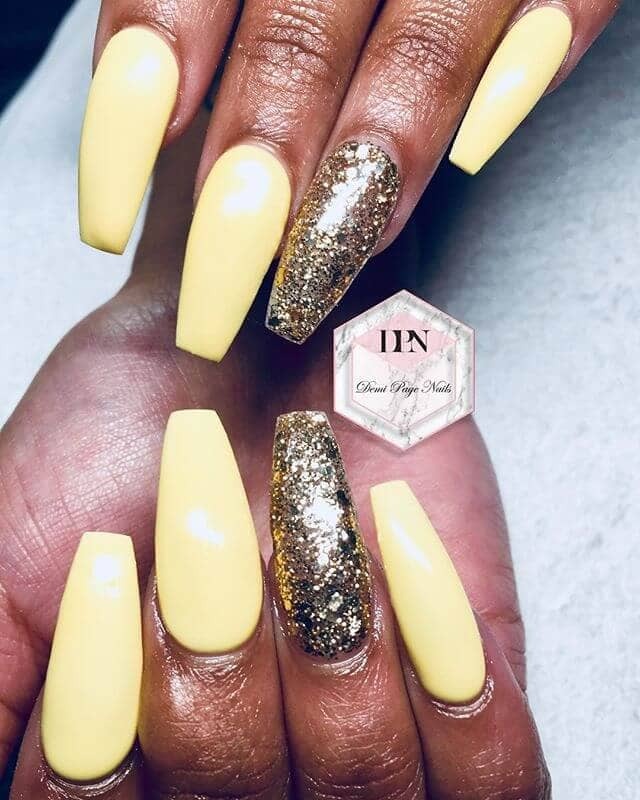 If you’re on the hunt for the perfect trendy nails for your upcoming formal event, these yellow nails will make an elegant and sophisticated addition to your special night. 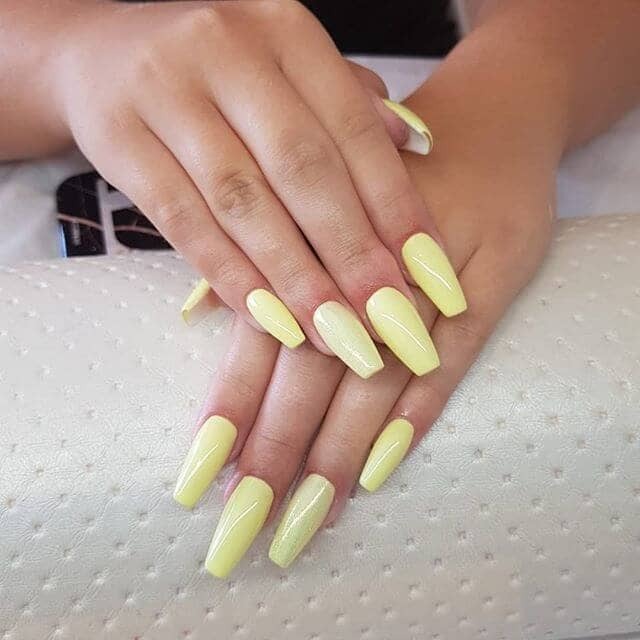 The ombre look is taken one step further with matte shades of lemon. Sparkly rhinestones on the ring fingers add an extra element of glam. These nails would look beautiful with a silver or gray formal dress. 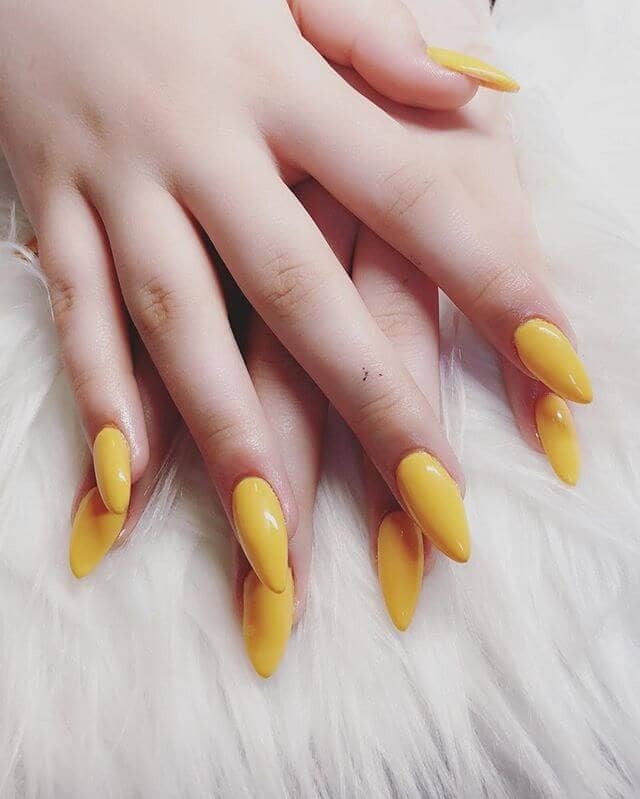 To get this dreamy look, start with a bright banana ballerina acrylic nail. 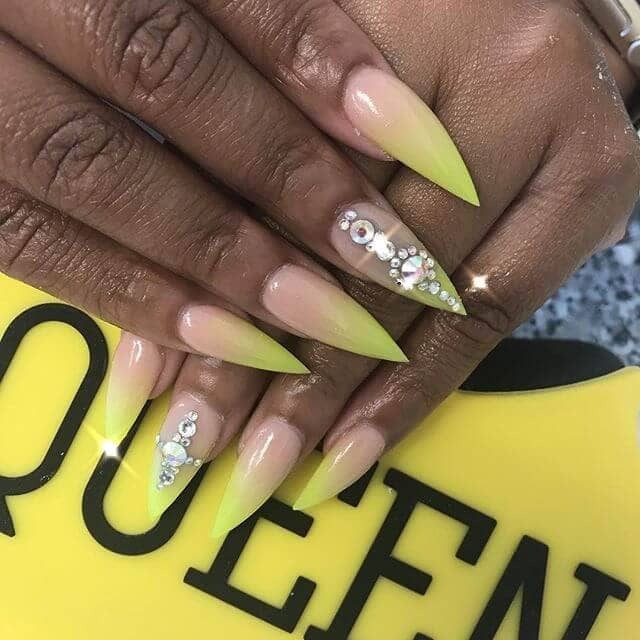 The accent nail is painted with opalescent shades of pink, green and gold that serve as the perfect highlight for the base color. These gorgeous nails allow your glamorous personality to shine through. Pair this look with your favorite dark jeans and a fun top for a casual summer evening look. 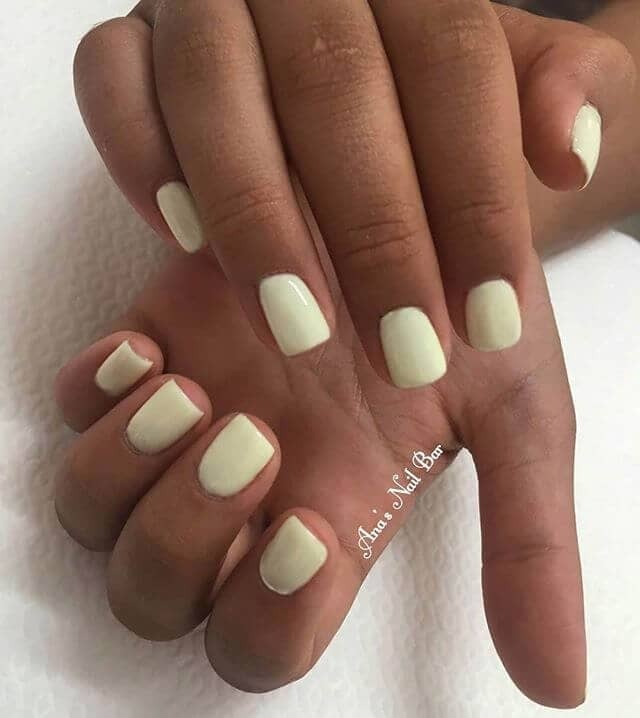 These square acrylic nails painted in a deep classic butter color have a timeless look that is perfect for summer. You can pair these gorgeous nails with an outfit in shades of a dark navy for a summery nautical feel. 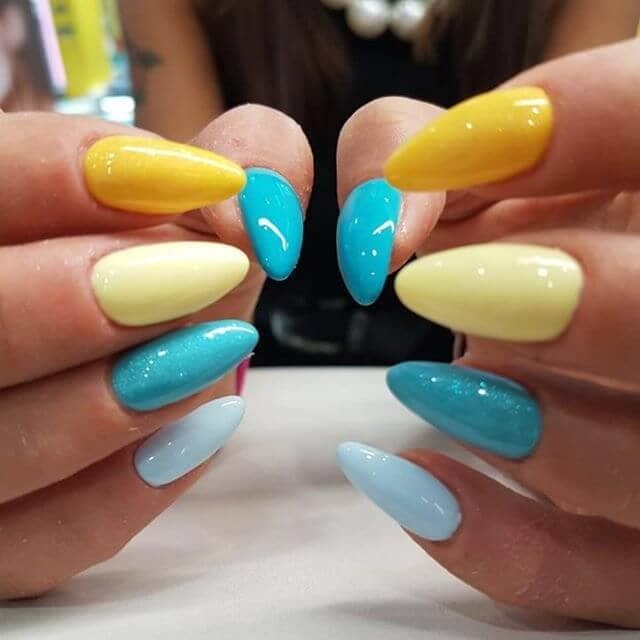 These nails are perfect for evenings on the boardwalk or pier with a soft sea breeze in your hair and a special someone by your side. 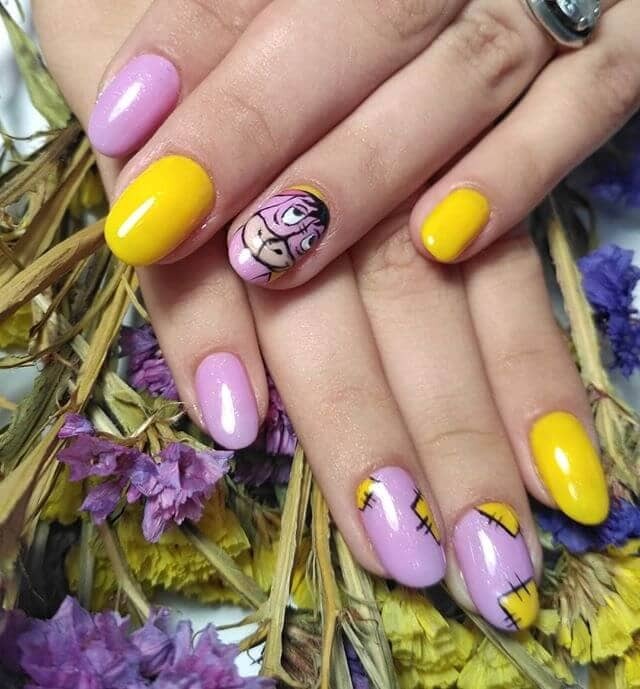 Share one of your favorite Disney characters with the world with these adorable nails featuring everyone’s favorite pessimistic donkey, Eeyore. The purple and yellow perfectly complement one another, and the fun patchwork details add a whimsical touch. These nails are great for a trip to Disney World, or if you are just wanting to get in the Disney mood! 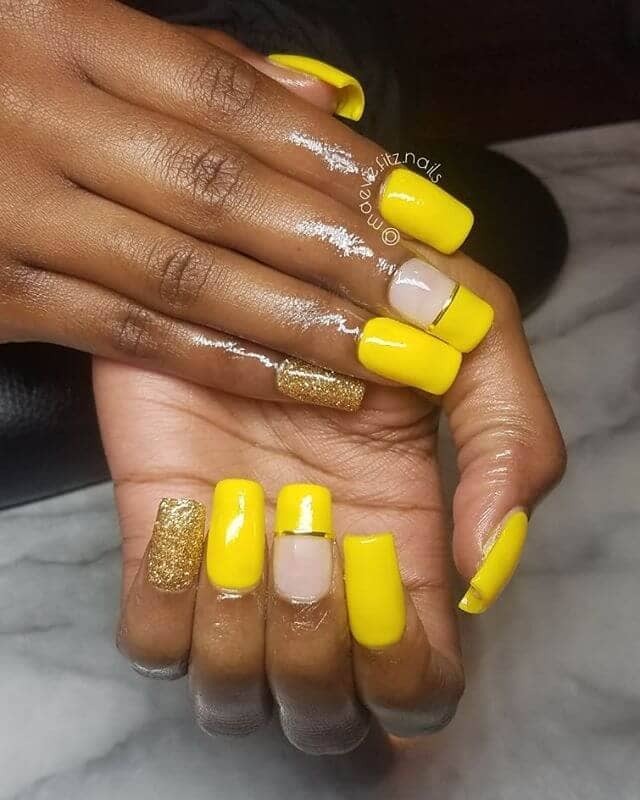 Yellow acrylic nails are one of the hottest nail trends of 2018. Yellow is a versatile color with a wide variety of hues that can be worn in any season and with any style of wardrobe. You can use this to make a statement about your personality, whether you prefer bold neons or soft shades of lemon. 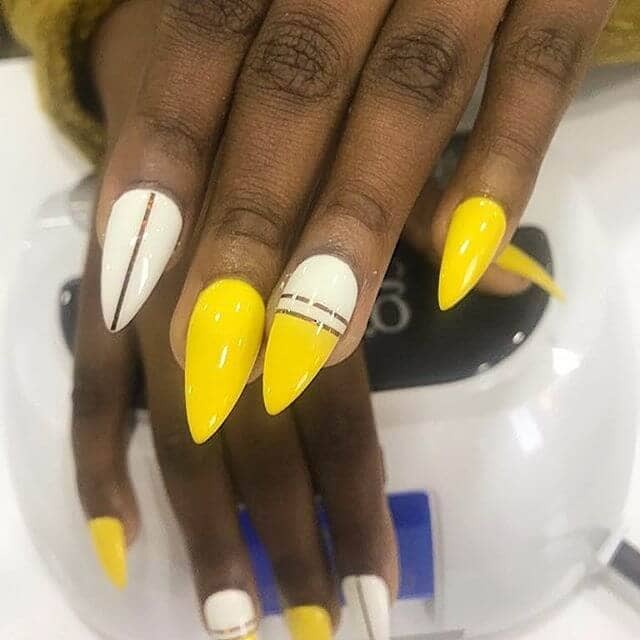 These 50 styles show you the many ways you can add yellow to your nail fashion, whether you prefer short or long nails, acrylics or natural nails. Read on to see how you can make yellow elegant and dressy or fun and casual.